MORE than half of a £6.2million fund originally earmarked by government for dementia care in Northern Ireland has not yet been spent, The Detail can reveal. The package was part of Stormont’s Delivering Social Change Programme which was financed by a mix of philanthropic donations and government funding to “transform the commissioning, design and delivery of dementia services”. Although the three-year fund was meant to finish this year, the Department of Health confirmed it had been extended until March 2018. However, despite the added time it will fail to spend over £1million of its original budget. A spokesperson said all the objectives will be delivered and that the underspend of more than £1million was due to savings that were achieved. However, a leading charity has now urged Stormont to ensure any unspent money is ring-fenced amid claims dementia care is already underfunded. 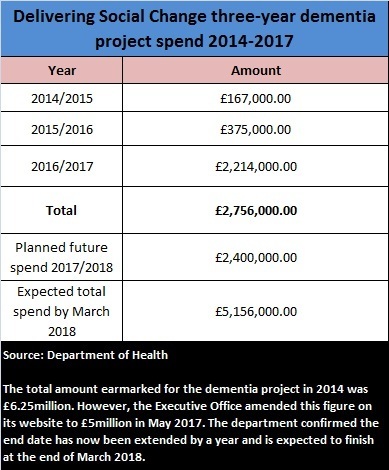 In a further development, while The Detail was waiting for the department to respond to queries over the budget, the Delivering Social Change section of the Executive Office’s website was amended so that it now states the total amount invested into the dementia project was £5million instead of the £6.2million announced in 2014. The department failed to explain the changes, which also included adding information about a new dementia project to improve data collection which it said was approved by the Executive last year and is expected to cost £7.3million. A subsequent joint statement to The Detail on behalf of the Department of Health, the Health and Social Care Board, plus all five health trusts said: “Although the total funding committed is less than what was projected at the outset of the project, the work streams have still managed to deliver all the objectives. Click here to read their comments in full. A table showing how the £6.2million earmarked for dementia care has been spent. It is a progressive illness caused by diseases in the brain and has been described as one of the biggest challenges facing society today due to an ageing population. There are more than 20,000 people estimated to be living with the condition in Northern Ireland. The £6.2million investment was announced in 2014 - three years after the publication of Northern Ireland’s regional dementia strategy – and was meant to finish in 2017. However in response to a Freedom of Information request the Department of Health confirmed that only £2.8million had been spent by the end of March. The department said it expects to spend a further £2.4million in 2017/2018 and this will be taken from the £6.2million budget. Bernadine McCrory, operations director for the charity Alzheimer’s Society in Northern Ireland, said: “The Alzheimer’s Society would like to see a review of the dementia strategy before we would draw conclusions on how the budget was allocated. This comes as it has also emerged that Northern Ireland’s health and social care trusts are failing to meet a target of ensuring at least 75 per cent of people with dementia receive a diagnosis and treatment. Click here to read more. 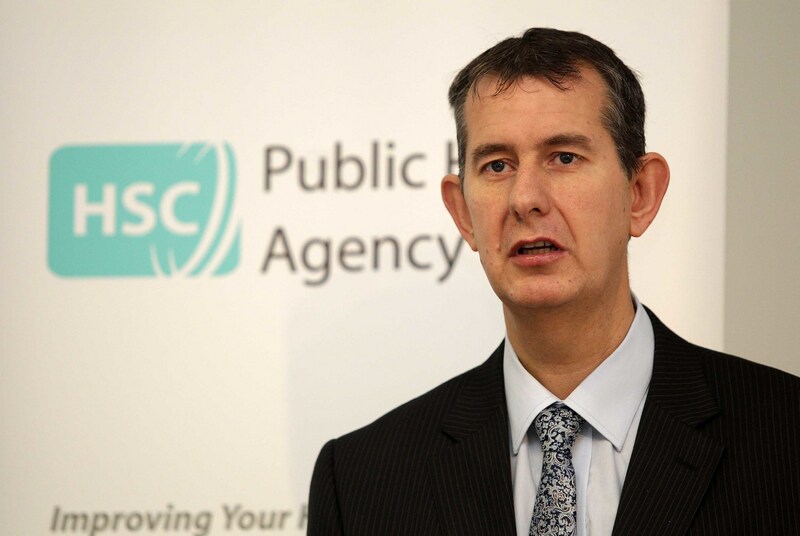 Former Health Minister Edwin Poots launched Northern Ireland's first dementia strategy in November 2011. In November 2011 the then Health Minister Edwin Poots launched a strategy to improve dementia care in Northern Ireland, but said there was no new money available to pay for it. The Health and Social Care Board took the lead in implementing the blueprint and contributed £1million into memory services in 2012, with this increasing to £2million the following year and each year thereafter. Meanwhile the Public Health Agency and the philanthropic organisation, Atlantic Philanthropies, invested £2million into research for a three-year period from 2014. However, it was not until the Stormont administration unveiled three new projects under its Delivering Social Change Programme in 2014 that real progress was seen in advancing the aims of the dementia strategy. The 2014 Delivering Social Change Programme was designed to herald advances in promoting shared education, schemes to support children and young people, as well as policies aimed at dementia. It was funded by the Executive Office and lead departments which were to contribute a combined 60% of the estimated total budget of £58million, while Atlantic Philanthropies committed to make up the remaining 40 per cent which was expected to be around £22.5million. Atlantic Philanthropies is a US-based organisation that has donated money to support public interest projects around the world, including extensive investment in healthcare. The Delivering Social Change Programme allocated £6.2million to implement three work streams under the dementia strand: raising awareness, training and development, and respite for carers. However, this figure was amended on the Executive Office’s website this month to £5million. Details of a second dementia project to improve how dementia data is captured, at an expected cost of £7.3million, were added to the Executive Office’s website earlier this month. A spokesperson confirmed this was approved by the Executive last year, and that a new system has been developed and is currently being tested. Click here to read the department’s comments in full.